If you’re following me on instagram or tumblr, you have already seen this and will know that my obsession with knitted pants has grown. Suspenders even more. Here is my most resent pair of pants that I made with Haru in mind. 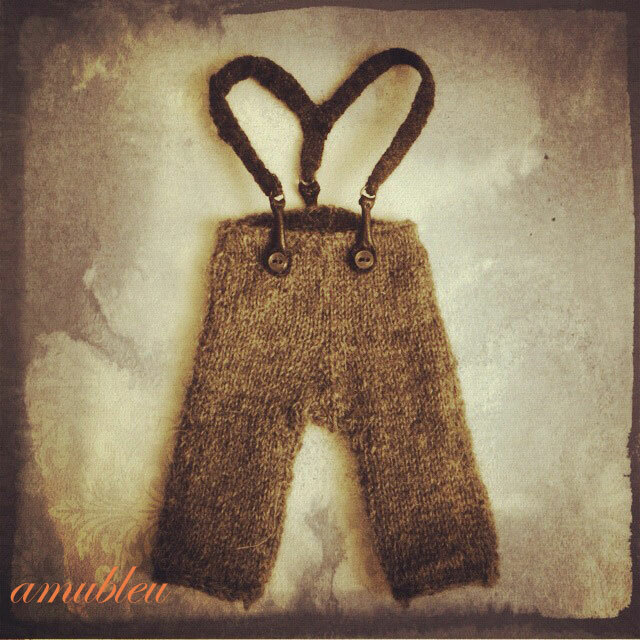 The pants are made from Shetland wool and merino. The merino webbing was used in the double knitted waist band. I wanted to make these pants a little less casual so to do that I had to get rid of the ribbing… at the same time preventing the ends from naturally curling (blocking only does so much). Double knitting in the round had been floating over my head and I thought I would see if it would work… am I getting too technical? The end result is a smooth, flat edge at the waist band and pant cuffs (and I nice contrast in color in the inside). I would like to mess around more with double knitting. Maybe fair isle secret messages into the inside edging of sweaters. The suspenders were something I’ve been wanting to try for a very long time and finally found a reason and a design I could put together to give it a try. Merino webbing, scrap leather and brass rings. I think they worked out nicely. I have to work out a way to stabilize the straps. Wool over time stretches and again blocking will only do so much to bounce everything back to shape. 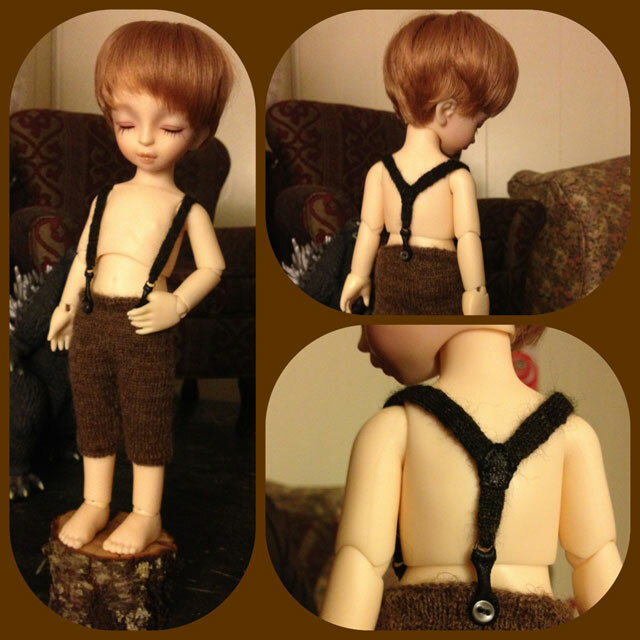 Oh, and the suspenders are removable. The leather bits were made with button holes. For years, and for fashion’s sake I thought knitted pants (and some skirt designs) were a big no no. But I find myself glued to making pants and improving my patterns. Now, I’m going to start to scale up. I think they would be cute on the Msd and Mnf boys so I’m going to give those a try next. As for the big boys I think I’ll make a few old fashion style boxer type shorts for my own. Especially for the resent boys I’ve been putting together. The thin lace weight yarn would create a nice drape. Also, with the larger scale I can maybe add a bit more details. We’ll see how things go. Each of my pattern take a lot of planning, math and a ton of trial and error. So it seems Mr Z. is going to be coming home a bit earlier than expected. He’s also going to be not what I had originally planned. Dolls do that quite a bit I’m finding. Not spoiling it for now (so secret ಠ_ಠ).